Take a look at Quadra-Fire’s scope of accessories that enhance the look and usability of your fireplace. Whether it’s controls, or termination accessories, we have you covered. 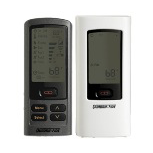 Be in control of your Quadra-Fire fireplace with remote and thermostat accessories. These items give you an unbeatable sense of convenience that you will love. 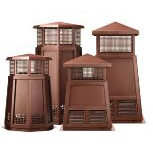 Add instant curb appeal to your home with termination caps and accessories from Quadra-Fire. These items aid in delivering top quality performance and add the perfect finishing touch to your heating system.